Acoustic seating is often found in break out areas or the ‘third space’ which is an area away from the workstation (the first space) with meeting rooms being the second space. 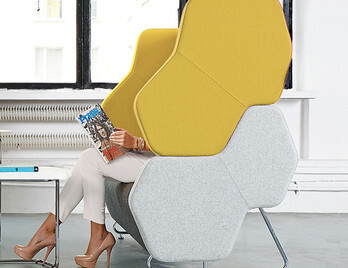 This type of seating is usually semi cocoon like with high backs and sides which can help significantly reducing external and internal sound making informal meetings more comfortable. 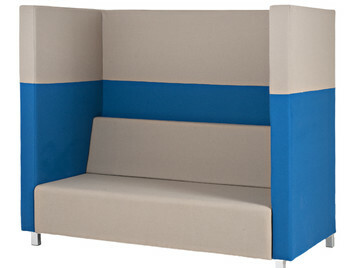 This type of seating can also be used for workers who feel the need to work away from their desks as power modules and data points can be implemented in to the arms. We offer acoustic seating for single users or for multiple users who want to collaborate, meet or discuss away from noises and other distractions. Harc is a beautiful all-encompassing high backed sofa which provides a comfortable place to escape the noise and hustle from the surrounding environment. It's sweeping curves and protective sides make Harc a brilliant solution and place to concentrate, listen and focus. Haven two seater sofa with a stylish design and elegant stitching detail designed by Mark Gabbertas. Haven creates an all-encompassing sense of privacy with inviting soft cushioning on the inner section with a formal structure of the outer shell. Haven can be combined with other models and elements in this range and available in two-tone upholstery options in designer fabrics. The Fence Sofa keeps you protected from neighbourly outside noise and visual distractions and can help contain your own hum drum and conversations from being heard. 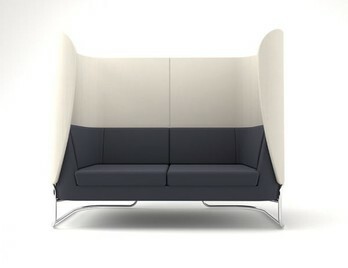 The clever use of the linear screen attachments turn this already stylish sofa into a meeting hub, pod or breakout sofa. With its sharp styling and soft padding the Horay sofa adds a linear dynamic aesthetic to any environment. 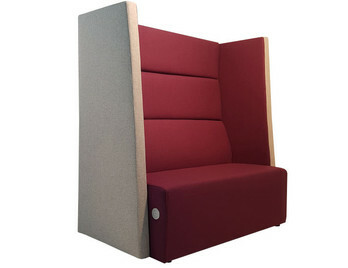 The high back and sides offer comfort and privacy for each person taking time out for meetings, breakout, working alone or in teams. Horay is not only available as a stand-alone module the range is extensive and many modular configurations and layouts are possible with additional items such as coffee tables, display screens and tables adding to Horay's endless potential. 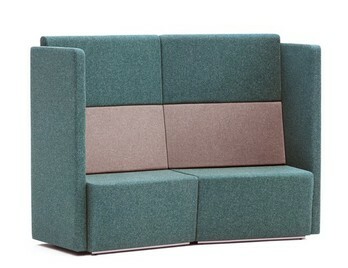 Totem high sofa is from a modular range seating system for breakout, reception and creative areas. 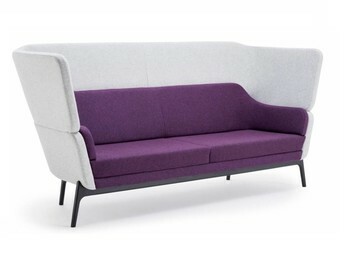 The concept behind this range came from creating a subtle concave on the sofa encouraging users to interact closely making discussions and meetings a little more intimate. Totem Concave High Sofa is from the Totem range of modular units with other sofas and corner modules building Totem to a tailored solution. Manufactured in the UK for a 20 day lead time. 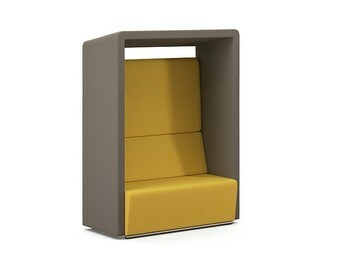 Connect High Back Sofa allows it's users to meet, discuss and connect within its acoustic sheltered confines. The high back and sides minimise visual and noise distractions from a 270-degree perspective retaining privacy for both user and bystander. 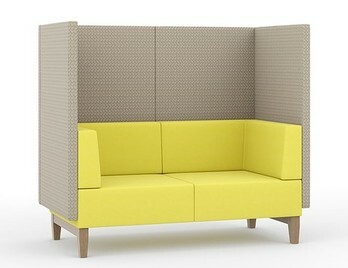 Converse is a dynamic looking high back seating range designed to maximise privacy whilst creating a buzz. The two tone fabric and futuristic block design give the range a distinctive look and feel. Converse is designed for the 'huddle' or for anyone wanting to work quietly on their own, maybe even to take or make a phone call. The seat has a deep solid feel and is very comfortable and the internal structure made for hardwood keeping it rigid. 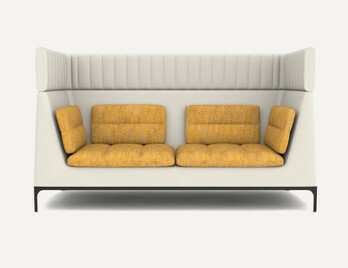 Two seater sofas with extra high back in a stunning design. 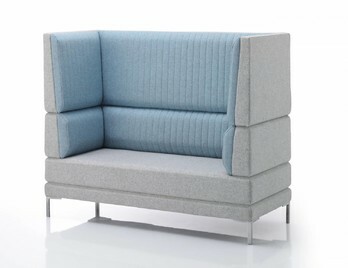 Manufactured in the UK these sofas have a five-year warranty and are suitable for a number of commercial applications. Normal lead time is 4 weeks from order. Please contact our design team if you would like to take advantage of our free space planning service in support of this product.